Several women were part of a yoga class. They had taken lessons together for five years. Their yoga teacher, Emily, an older woman, was about to retire after twenty years. They were going to miss her. She was kind and accepting of what you could and could not do with your body. Every student felt valued, and in turn, they valued her and would miss her. ﻿Often the women would meet at the nearby coffee shop after yoga. They decided to have a party for Emily and give her a parting gift. 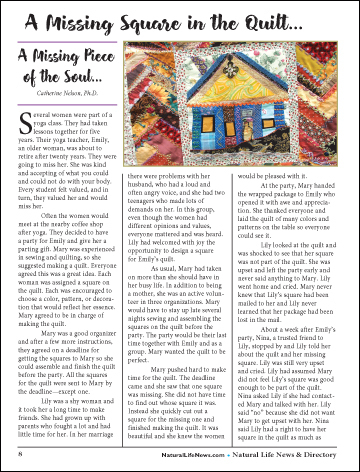 Mary was experienced in sewing and quilting, so she suggested making a quilt. Everyone agreed this was a great idea. Each woman was assigned a square on the quilt. Each was encouraged to choose a color, pattern, or decoration that would reflect her essence. Mary agreed to be in charge of making the quilt.